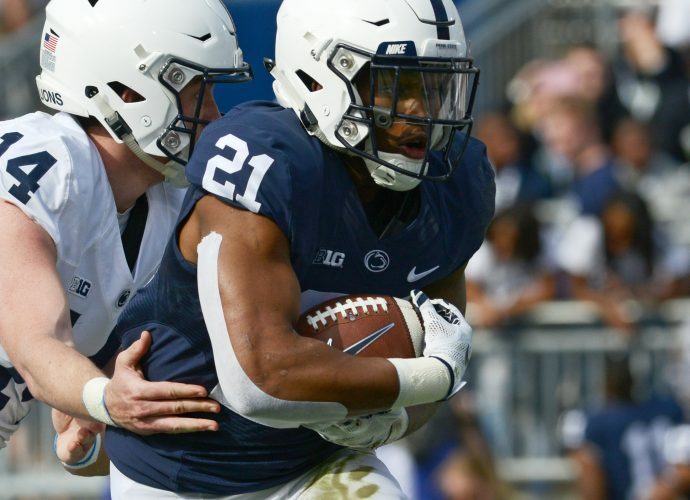 For the third straight game Saturday, Penn State’s offensive play calling late in the contest left many people wondering what the Nittany Lions were doing. It’s a big problem, and quite frankly, it’s getting to the point where you truly have to wonder if James Franklin and his staff are capable of solving it. Penn State held on to beat Indiana, 33-28. But make no mistake, the Nittany Lions were lucky. If the Hoosiers, who were driving, had another minute or even 45 seconds on the clock, they very well may have have dealt Penn State a third straight punch-in-the-gut kind of loss. All because of a highly questionable — at best — and at worst totally absurd decision to keep throwing the ball with a two-possession lead and 4 1/2 minutes remaining. Was Franklin merely trying to get a first down, as he said, to inch closer to sealing the win? Or, did Franklin’s ego get in the way, with him attempting to have his offense add on another late touchdown and run up the score to make his own team feel better? Franklin has done the latter on several occasions during his Penn State tenure. He lets his quarterback, be it the starter or even the backup, keep throwing the ball late in games that are already decided, and on numerous occasions the Lions have indeed added that extra score for a more lopsided final. Hey, we’ve come to accept that’s pretty much Franklin’s M.O. For better or worse, he’s going to keep his foot on the gas pedal. But what happened late in the game at Indiana turned into a fiasco that could have cost Penn State dearly. And it continued the Lions’ recent trend of having all sorts of trouble with their four-minute offense, which failed late and led directly to losses against Ohio State and Michigan State the previous two games. The Lions led Indiana by 12 and took over at their own 37 with 4:35 remaining. The Hoosiers had two timeouts. Just about every football coach alive would run on first down. By doing that, the opponent immediately has to burn one of its timeouts. Penn State threw the ball on first down. Incomplete pass. Clock stopped. Just about every coach alive would run on second down, again, to make the opponent burn a timeout. And especially after what had occurred on first down, that would have been the smart play. Instead, a pass. It was a short, safe completion to running back Miles Sanders, and when he was tackled for no gain, Indiana took its second timeout. Third down is tricky. A lot of coaches save that down to try a pass in an attempt to get the first down, which pretty much ends the game. It’s hard to fault Penn State for throwing on third down. However, because the Lions threw it incomplete on first down and helped Indiana save a timeout, the smart thing to do on third down would have been to run it again. So what if you don’t get the first down. It would have backed the Hoosiers into the corner of calling their final timeout, which would have changed the complexion of the rest of the game. But Franklin and offensive coordinator Ricky Rahne had Trace McSorley throw the ball again. And again, the pass was incomplete, the clock stopped and Indiana got to save its final timeout. The Lions, after eating up a grand total of only 29 seconds, punted. It was, for all intents and purposes, a disastrous drive and sequence of events. It left Indiana with plenty of time to win the game, as long as it could score a TD and recover the onside kick. The Hoosiers did both, which is a credit to them. But again, the primary question is this: What was Franklin’s motivation on that offensive series? But why? It made no sense being aggressive there. You have to either kill clock, or make the opponent use all of its timeouts. By failing to do either, well, it was really, really bad clock management. My personal belief, based on history, is that Franklin wanted to score again. You can believe what you want to believe. Having seen him do so on several occasions, I believe he wanted to add the exclamation point with another touchdown and have his struggling offense get the heck out of town with a little more confidence. Had it all worked out that way, no one would have cared much. But because it didn’t work out, Franklin put the team and himself in a bad position. He left himself open to heavy criticism once again because Indiana drove for a TD, recovered the onside kick and had at least a chance for a winning score. Unlike in games against the Buckeyes and Spartans, this time the defense saved the day at the end. Barely. Indiana had only 49 seconds and one timeout on its final drive. Had Penn State handled things better on its possession, that would have been either about 45 seconds and no timeouts, or 10 seconds and one timeout. Those are big differences at that stage in the game. The Hoosiers wound up getting to the Penn State 44 before running out of time. OK, Penn State won the game. That’s the main thing. If you think all of this is nitpicking, that’s fine. A win is a win is a win. But what we’re talking about here is having faith in the coaches to do the right thing with the game on the line in the closing minutes. As successful as Franklin has been overall, there’s really not much reason to have faith in his decisions in the closing minutes of tight games.